We hear that the Committee of the Navigation Board, have settled the rates for passengers from Dublin to Monastereven and the intermediate places, as follows: to Hazel-hatch, eight miles, one shilling and a penny; to Sallins, fourteen miles, two shillings and two pence; to Monastereven, 31 miles, three shillings and nine pence halfpenny; steerage passengers half price. Nobody boats on the canal in winter? … and a two-man racing kayak that I didn’t photograph. All in the space of about half an hour at Sallins. 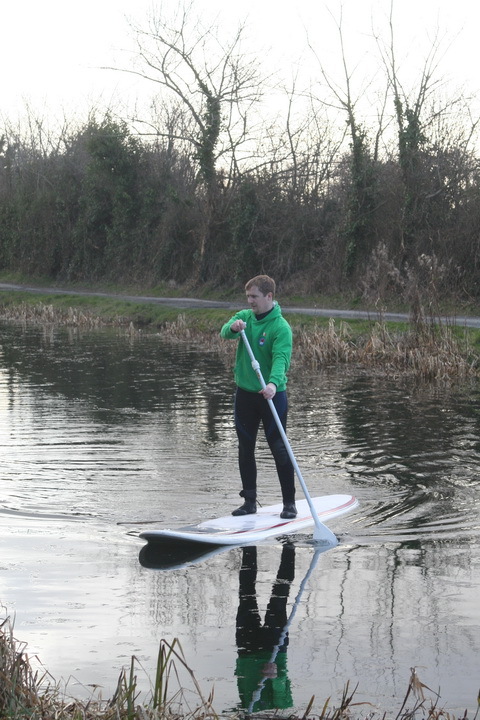 I would be grateful if you could tell me whether any person applied, under byelaw 38q, for permission to hold an aquatic event on the Grand Canal at or near Sallins on or after Friday 24 January 2014. No-one applied to hold an aquatic event on or around that date on the Grand Canal. If I were Waterways Ireland, and I heard a rumour (or got a tip-off from the NSA) to the effect that some boaters were going to hold a demo at Sallins, and if nobody had asked permission to hold the demo, or made any arrangements with me about it, and if I expected work to start shortly at Sallins, I might be worried that the demo might turn out to be more than a photo opportunity: that it might turn into an occupation or moor-in, one that would delay the work and possibly expose me to additional costs. ( b ) preventing the passage of a boat in respect of which a permit has not been issued under these Bye-Laws, or has been withdrawn, or is not displayed in the manner prescribed in Bye-law 40 of these Bye-laws. If I were not Waterways Ireland, then, but a would-be demonstrator, I would make a note to inform the authorities next time I planned a demo so that there would be no surprises on either side. I am, however, neither WI nor a would-be demonstrator, so (apart from the information I gleaned from WI) I know nothing of what either side may have done or not done, thought or not thought.